As a home owner, you know there are plenty of things to keep you busy around the house. The last thing you want to worry about is maintaining your lawn, especially when the average home owner spends more than 40 hours a year on lawn care. Isn’t there a better way to use your time, energy and money? The answer to your lawn maintenance headaches is our Artificial Lawn solution, a revolutionary synthetic turf that looks and feels like real grass … but without all the maintenance necessary with real grass. 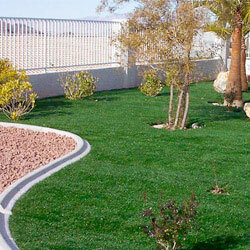 Imagine having a gorgeous, green lawn all year long under any weather conditions. That’s right, a durable, professionally manicured green lawn all year long that requires no mowing, watering or chemicals. On this Web site, you will discover that artificial lawn solutions have been installed in thousands of residential and commercial locations worldwide. We truly offer the industry’s most advanced and money-saving artificial turf. And, unlike some other types of synthetic grass that are created more for appearance than function, this is a turf that looks and feels real. Due to its virtually maintenance-free design, not only does Artificial Grass save you time and money, it helps preserve the environment. For a one-time capital improvement expense, Artificial Grass will dramatically lower ongoing lawn costs and increase property value for many years to come.